Buckeye QB has four touchdown passes with just three incompletions … Opponents haven’t been stout, but Ohio State has scored 77 and 52 points in two games … Defense performed better, but largest test is looming. COLUMBUS — Before we get to our Ohio State concerns, of which there are a few, let’s allow a little time to gush over Dwayne Haskins. Again. I’ve heard many say Haskins is the best passer the program has produced since Troy Smith, who took home that aforementioned granite statue. But I believe the Maryland native is the best I’ve seen since covering the Buckeyes, and it’s not even close. I know they’ve only played two games against teams that could be ranked 63rd and 64th among all power-five schools, including Saturday’s 52-3 win over Rutgers. And if you think those ratings are a little harsh, the Buckeyes battered the Scarlet Knights in their previous two meetings 58-0 and 56-0. Even Ohio State fans had so little regard for the visitors that attendance was just 93,057, well below the norm of 100,000-plus. 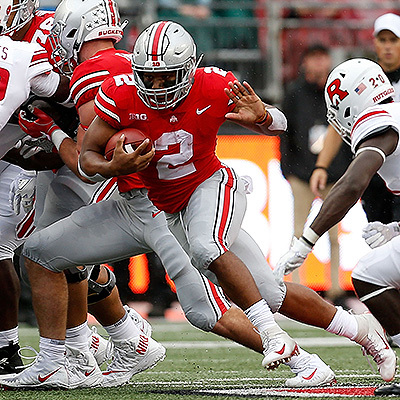 But the way Haskins delivers the ball — tight spirals on target with lots of zip — isn’t something we’ve seen from anyone toiling for the Buckeyes in eons. He finished 20-of-23 for 233 yards and four touchdowns while playing barely more than a half. In two games, including a 77-point barrage against Oregon State, he’s 42-of-53 for 546 yards. He’s got nine TDs with one interception. His completion rate is a crazy-good 79.3 percent. We’ll need to reserve judgment until he faces a defense that’s made up of more than five tackling dummies, three cheerleaders, two Cigar store Indians and a drum major, but he looked just as polished in relief at Michigan last season — and many believe the Buckeyes would have done damage in the college-football playoffs if coach Urban Meyer would have given him the job earlier (I’m with them). 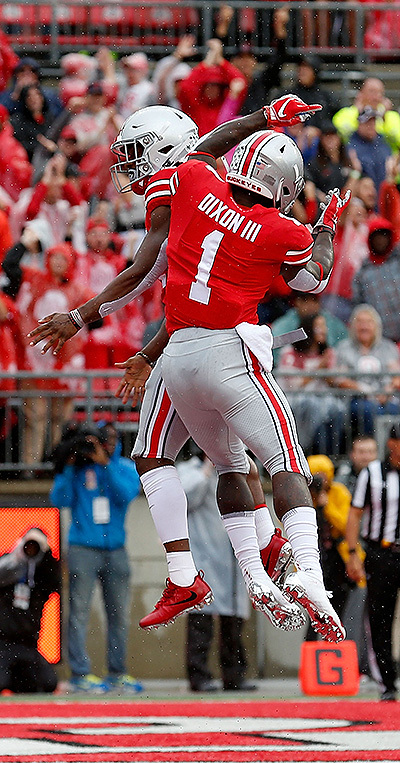 Johnny Dixon celebrates his 40-yard first quarter touchdown from Dwayne Haskins. On the first series, Haskins threw a beautiful ball for a 38-yard TD to Johnny Dixon, who had a step on a defender and caught it in stride. But the drive would have died if the 6-foot-4 sophomore didn’t convert a third-and-6 with an eight-yard sideline pass on the button to Austin Mack. What’s significant about the play is that third-and-6 wasn’t necessarily a passing down last year because Meyer didn’t trust the quarterback’s arm. But it’s low-hanging fruit for Haskins, and we can expect more calls like that instead of a batch of QB runs. We may be guilty of picking nits here, but the aspect of Ohio State where the jury is still in deliberations revolves around the defense, which was gashed by Oregon State for 316 yards on seven big plays (the Beavers had 76 yards on their other 55 snaps). The unit fared much better against Rutgers, which had 134 total yards on 61 plays with a long gain of 15. Veteran safety Jordan Fuller was back in the lineup after missing the opener and made an obvious difference. I still have questions about the linebackers going into the TCU game, though. The talent is there, but the instincts, eh, we’ll see. Baron Browning started in the middle again. The 6-4, 238-pound sophomore was a top-10 national recruit from Texas, and he was an absolute manchild in high school. Google his highlight tape, and trust me, it will leave you shaking your head in wonder. But he seems to be playing while wearing 3-D glasses, as if he’s seeing plays through out-of-focus lenses. That extra one-Mississippi-two-Mississippi while he decides where to go is the difference between a stop at the line and a five-yard gain. Tailback J.K. Dobbins runs for positive yards in the Buckeyes’ 52-3 Saturday win. Third-year sophomore Tuf Borland (6-1, 230), the starter last season in the middle, is working his way back from offseason ankle surgery and, while quicker to react, may not have the bulk to stand his ground against the brutes up front. Junior Malik Harrison and sophomore Pete Werner are the outside linebackers. They show promise, but I’m not sure either is the next A.J. Hawk. At this point, the Buckeyes would settle for another James Laurinaitis, who was inducted into the Ohio State Hall of Fame at halftime. I watched much of TCU’s 42-14 win over rival SMU late Friday night. The Horned Frogs are tough to defend with 6-2, 230-pound sophomore Shawn Robinson behind center. He’s a former four-star recruit and the sixth-ranked dual-threat QB in the 2017 class. They are dangerous running the zone read, and Robinson often gave SMU fits by pulling the ball on run-pass options and finding open receivers. But I’ve got a hunch the Buckeyes will be able to score at a high clip, even against an athletic defense. 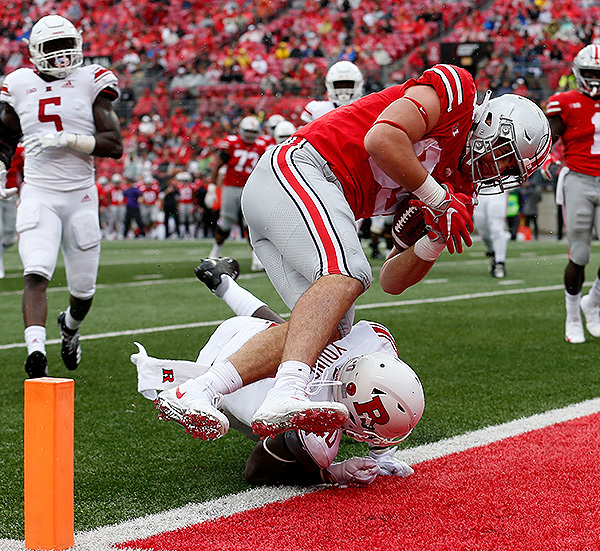 *Note: With apologies to readers and sponsors, due to Saturday storms and loss of service our coverage of the Buckeyes win over Rutgers has been published later than normal. We hope to return to our normal schedule by Monday. The McKinley Funeral Home of Lucasville, Ohio, proudly supports the Ohio State Buckeyes on Press Pros.